Located on the property of the Aston Ka’anapali Villas, Castaway Cafe serves breakfast, lunch, and dinner, and includes a special keiki (children’s) menu for your little menehunes. While dining on macadamia nut, pineapple, and banana pancakes for breakfast, a barbecued pork sandwich for lunch, or shrimp and mango curry for dinner, you’ll see why this is one of the locals’ favorite secret spots. 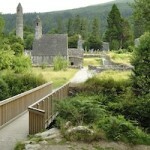 In sixth-century Ireland, St. Kevin sought a haven of peace and serenity for his monastic “city.” He chose Glendalough. Strolling through this valley, you can understand St. Kevin’s thinking. Take one of the many paths into the forest and you find yourself alone, forgetting about the outside world. There are no sounds of traffic. No crowds. The smells of the forest fill the air. The leaves gently rustle. Birds dash between the trees. Away from modern society, you can see why St. Kevin chose this place of spiritual peace.